Film stars establish and maintain their popularity not only according to their artistic talents but also due to their personal appeal. 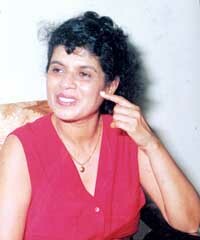 World acclaimed actress Nita Fernando, had two breaks during her acting career due to personal reasons. She entered filmdom in the late 60s while attending school. Her first performance was in the film Landaka Mahima and there onwards for eight long years she was able to play the main character in many films, Duhulu Malak, Lasanda, Hadawath Neththo, Mangala and many more adding up to 40. All this was in a short stint during seven years. She made a come back in the early 80s. Directing and acting in the film Sooriya Kantha. Her second come back was after a decade with her acting skills reaching a peak and being richly rewarded. Nita performed in Saroja and Bheeshanaye Athuru Katawak but Pauru Walalu was the turning point in her career. Her performance was duly recognised and appriciated while bringing herself and the country pride and fame. Nita was elected best actress for her performance in Pauru Walalu and many awards followed. The film was represented in many competative and non competitive film festivals including those in Singapore, France, Japan and India. She also appeared in a single episode tele drama Sooriya Wansaya and a family teledrama Kahala Nadaya and conquered the mini screen too. The film Pauru Walalu was a land mark in my acting career. Though I had two intervals during my career I feel happy that I was able to achieve something for my country and the film industry, says Nita. "We have talented directors and artistes who could make a difference. But they are not ably supported with finance and other facilities. This is why the film industry is in a pathetic situation today", Nita explained. Though a talented actress, her priority was her family commitments. When her late husband wanted her to join him to go to Canada, Nita readily agreed. "My life was never in films and my husband opened the real world for me from the celluloid world I was in. This reality made me understand what life is and the real purpose of living. I am very grateful to him for what he did for me. I enjoy all the comforts today because of him who was a loving and understanding husband", Nita recollected with tears rolling down her cheaks. Her husband was the driving force behind Nitas success story. Though not full time, she is still involved in performing. Apart from three teledramas she had accepted, she is currently working in Bennet Ratnayakies w.w.w.dot com. This simple, unassuming actress is very much committed to up grade living standards of the less privileged fellow citizens. Her love, wealth and time are used for the benefit and pleasure of the needy. Her charming, friendly nature makes one forget that she is a world recognised actress. Her glamour has not hid the true humanbeing in her. "I do not want to be away completely from the world of art. When and if there is suitable characters for me I will consider them", says Nita. It is unfortunate that quality films are hardly produced today. As an industry it is in the doldrums and unless a miracle happens, we will not see, Nita performing in the silver screen any more.